For reliable power you can't beat a Yamaha inverter generator. They produce clean power and don't rely on weather or external power. Yamaha inverter technology produces pure sine wave power and is safe to use with the most sensitive electronics. Yamaha inverters are also lightweight, quiet and efficient. This makes them popular choices for a wide range of applications. Having access to power can make your outdoor adventures even more enjoyable. Yamaha inverter generators are the lightest and quietest available, so they are perfect for using outdoors when you still want to soak up the serenity. 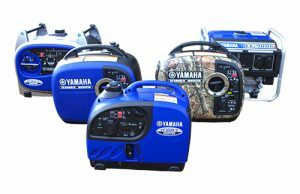 Yamaha's 1 kVA Inverter and 2 kVA Inverter are great choices if you want a super portable inverter generator. Reliably powering the fridge, lights air conditioning and appliances in a caravan is a must for many travelling enthusiasts. Yamaha offers the widest range of premium inverter generators, so you can be sure you have all the power you need. The 2.4 kVA Inverter is our most popular choice for a caravan generator since it will reliably power air conditioners when other brands can't. Power outages are becoming more common in Australia and a large number have households have been without power for days at a time. That's why Yamaha inverter generators are becoming increasingly popular for home backup. Whatever your application the Yamaha range of generators is sure to have a model to suit your power needs. So click onto our Store Locator to find your nearest Supplier.